I remember vividly the wonder I felt when Mrs. Gardner, my 7th grade teacher, explained the universe and solar systems and galaxies to our class in a way that I got. It was the first time I truly got a sense of the incredible and incredibly tiny space I occupy in the world. I understood, for the first time, how much I really didn’t understand. 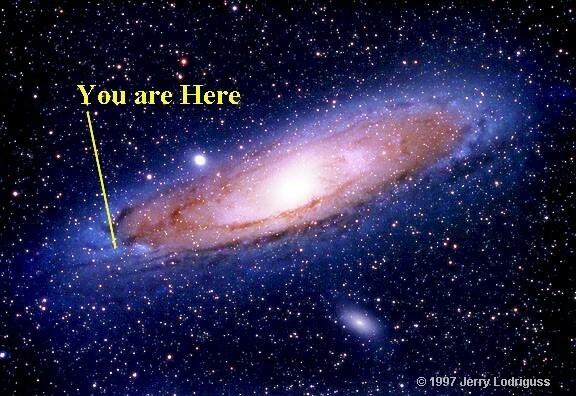 How much there was Out There in the universe. That as bright and busy and amazing as the solar system is, there are, potentially, millions of other galaxies like it out there. I got that there is a very high likelihood that there is life of some sort Out There and that I would be extremely arrogant to believe that only on Earth could there be life. I got that when we look at a star that is light years away, we are actually seeing it the way it was in the past. We are actually looking back in time! I was floored as all these realizations occurred to me. Check this out to get a sense of exactly how tiny our Big, Blue Marble is here. I remained in that state of wonder for days and allowed the tininess of my being and existence and world to sink in. I thought about how, if we looked at all the time that has passed or will come to pass, my life barely makes it as a dot on the Timeline. Barely. And yet, I live my life as if it is the highlight of that timeline. For me it is. For each of us, it is. It has to be. I make decisions and choices and friendships as if my life is of utmost importance in the scheme of things. So it is quite something to think of my union with my partner as something the universe had conspired to create. And I sat there with this thought in my head as I looked at him and listened to him talk. I felt good in his presence. I felt most like me in his presence. And the thought sat there in my mind for at least a day. And then the universe said to me, “Why not him?” And then began the butterflies and a slightly different kind of joy whenever I saw him. The universe was conspiring to bring us together. Back during my every-weekend-is-a-party days, prior to graduate school, my dear and nutty friend, Paula, and I would head out to the cool spots in Atlanta open to whatever party happened upon us and every outing was always fun and what we believed would be memorable. We spent most of the night laughing and thoroughly enjoying each other while basing our entertainment on the throngs of women and men who were out to Meet Someone. We were above that, of course. We were just there to aim our spitballs, pretend to card people before they got to the door (and they were always unsuspecting and obliging) and toss ice cubes in the air and be completely surprised that it was hailing indoors when people looked back at us. We often said at the end of a ‘party’ that we didn’t really need anyone else as the two of us could have had just as good of a time had we been in a padded room by ourselves. We cracked each other up. We also had our stream of jokes to tell that played off each other that we thought were completely hilarious – not so sure about the people around us. There was one particular joke that we had down pat that was always a sure thing as far as cracking us up. It was a two-part joke. Paula told the first part, which happened to have a not-so-funny punchline, at the end of which we always exaggerated our amusement. We then gave it some time and talked about other things while Paula seemed a little disappointed that nobody had laughed as hard and I tried to explain how good the punchline really was. Eventually I chimed in and told the second part of the joke in which the punchline related right back to Paula’s joke. It was always a hit and we laughed hard EVERY TIME like it was the first time. Fast-forward to living slightly more grown-up lives with Paula moved far away from me and happily married to a great guy and me cuddled up to my then boyfriend. He tells me a joke with a not-so-funny punchline. A somewhat altered version of Paula’s joke, but I recognized it. I let out a not-so-amused laugh and we chatted about something else. Then, I chimed in with, “Wanna hear a joke?” And I told him the second part of the joke and related it right back to his part. He was amused and bewildered and wildly impressed. He really hadn’t seen it coming! This was one of the times I was sure the universe had conspired to bring us together. There was another time when we were putting off….ummm….taking a break from our graduate school work by going to garage sales then decorating our humble abodes. Yes, as grad students we lived humbly and attended events for free food and shopped garage sales so we could have fancy stuff in our homes – mostly to distract us. As I was carefully rearranging his books and noticing each one because his books gave me some insight into him, I picked up The Prophet by Khalil Gibran and looked up at him. He said simply, “That’s my favorite.” And a little something in me was in awe of a realization about the universe because I had the same copy of that book and it was my absolute favorite, too. The universe had conspired to bring us together. And then there was the card-playing and the competitiveness it brought out in us. Rook was our game. We learned it together on a beach and played it over and over and over and over again. And the replays were only because neither of us could stand to lose and leave that way. So we asked for another game and kept going. The universe had conspired to bring us together. This time for a lesson we had to learn about life. A lesson we’re still trying to learn. After all, when you put stubborn (him) and prideful (yours truly) on display, they both look the same and they don’t get along easily. There are winners and losers in most games, but when love is the focus, we’re all winners. We’re still working on this one, but we’re not staying up nights trying to win anymore as our focus turns more towards love. We’ve also put away the cards for now. The universe has conspired to bring us together. The universe has conspired to bring us together but our togetherness was not the end. No, we were brought together to continue on this journey of life in each others presence. Our union is designed so that other marvelous things can continue to happen. Our joys and struggles are equally important. We grow better as we become more our SELVES. We grow better as we become more our Divine Spirit selves. In the midst of the marvelous universe, there is some order to the entirely unknowable universe. There is a design in the way our lives came together in the same way there is a design in the way the galaxies exist and move and change. The realization that the universe has conspired to bring my partner and I together continues to sink in. The realization that the twinge of hope for a wish that I felt years before in my soul or that was felt in the soul of something much greater than me set the entire universe to conspire in my favor. The realization that many, many years ago, a man and a woman had their fourth child on the east coast of Africa and a man and woman had their first child on the east coast of the U.S. and that years down the road the two would meet in a hallway of a university and the boy would say to the girl, “So you must be Rhina,” and the girl’s soul would know before she ever did, that the universe was conspiring right in that moment and had been all along. 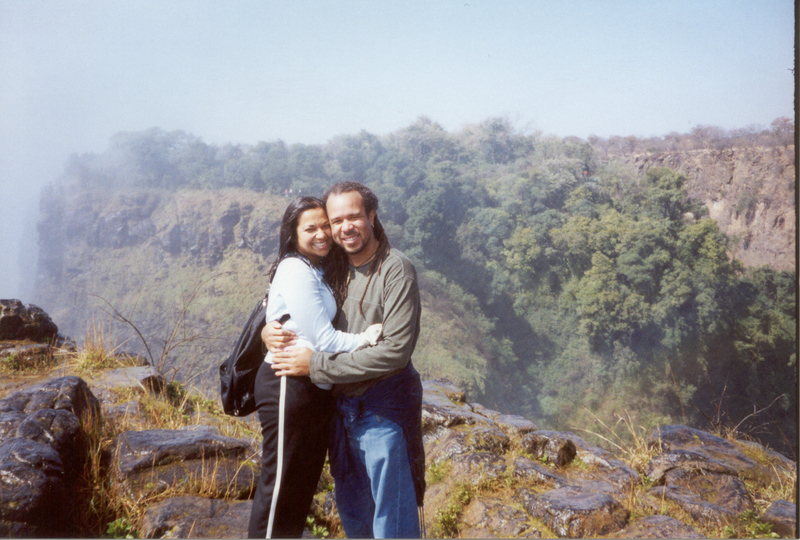 Brian and I at the edge of The Victoria Falls on the Zambia/Zimbabwe border moments after we got engaged. The moments of realization that the universe, the entire marvelous universe, has conspired to create my life into what it is continue to show up for me. And as I continue to be in wonder of how I fit into the entire marvelous universe I can’t help but feel more of a responsibility for my dot as well as a deep sense of comfort that the universe is conspiring in ways that do not always need my knowing. The twinges of hope for wishes are simply glimpses into the soul of my future. How about you? What has this marvelous universe conspired to create in your life, in your dot that is highlighted for you on the Timeline? What twinges of hope for wishes showed up in your life many years ago that the entire universe conspired to create in your life? What twinges of hope for wishes are you feeling in your soul today that will nudge the universe to conspire in your favor? Him (excitedly from another room): Hey, Rhina, come see this! Me (walking into the room several minutes later): What is it? Him (still excitedly exploring an electronic gadget): See this? You can do this and look what this does. Look at this! Isn’t that cool? This is so amazing. Do you see this? You can even do this! Are you looking? Isn’t this cool?!!! Me (curiosity dying as I realize it’s an electronic gadget): Oh. Yeah. That’s really cool. Huh! Him (incredulous): Really? That’s all you have to say? You’re really not impressed? Seriously? Me (feeling defensive and stressed out because I’m disappointing him): Well. It’s cool. Really. Him: (Shakes his head and walks away dejected). For as long as I have known him he has been coming up to me with things such as Bluetooths (or is it Blueteeth?) and DVRs, iPhones, iPads and touchscreens, etc. and showing me a sampling of the amazing things they can do and I have had the same sort of reaction, “Oh. Yeah. That’s really cool. Huh!” And he is always disappointed in the same way. This is a pattern. Let me tell you a little truth about me that he doesn’t seem to get. I am impressed by technology. I really am. I am extremely impressed. 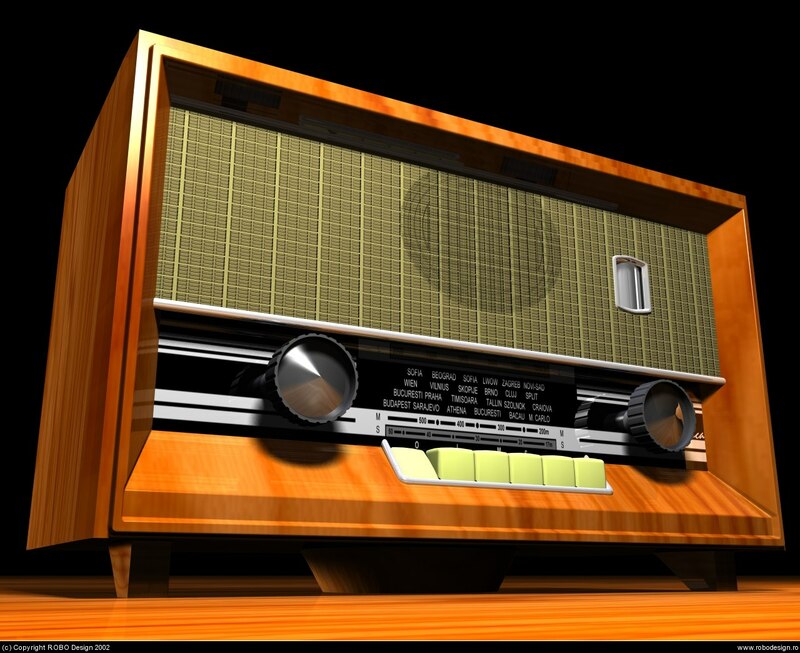 However, I’m still stuck on the incredible invention of THE RADIO!!!! The radio still leaves me in awe. My mind is baffled and amazed at the fact that another human, same species as me, invented the radio. Seriously, how do you one day figure out how to play music in one place and somehow pick up those sound waves in a very distant place? If you think about it long enough, it baffles your mind, too, doesn’t it? It leaves me wowed in a mouth-gaping, shaking-my-head-in-disbelief and eyes-wide sort of way. The radio leaves me floored. No jokes. No exaggeration required. I can’t wrap my mind around it and I am immensely in awe of how one of us humans figured out that invention. Let’s just say that my level of amazement can only peak so high and they had me at radio. He just doesn’t get it. It so happens that the stores with the “nice” mirrors that lie to you tend to also be the “nicer” stores with the bigger price tags. Don’t panic, friends who know me, I am a bargain shopper REGARDLESS. Compliment an outfit or pair of shoes or handbag and the first thing out of my mouth is the happy bargain price I paid for it. I have no shame in this. I actually take pride in it. Back to my point, though – mirrors matter. They can affect the lightness or heaviness of the steps I take – whether they are lying to me or not. They can even motivate me to get in a workout to maintain the svelte and cut self I saw in the mirror. In many ways, we are also mirrors for each other. We are constantly, whether we like it or not, holding up mirrors that allow others to see themselves. And when we see ourselves in the mirrors held up for us, we live up to – or down to – the images we see in them. The mirrors we hold up for each other matter and we must be careful with them. 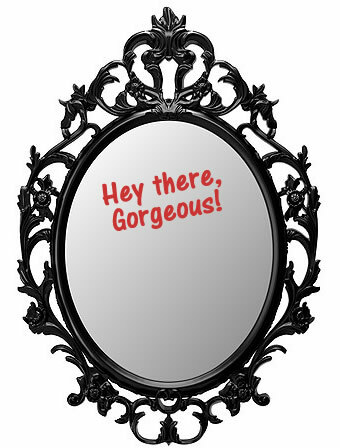 Friends, strangers, family and loved ones alike hold up these mirrors daily. As a parent, I hold up mirrors for each of my children. Teachers hold up mirrors. Aside from the mirrors that parents hold up for their children, there are few other places in which these mirrors matter more than when teachers hold them up for their students. The mirrors teachers hold up reflect the potential teachers see in their students and every teacher has a different mirror for each child they teach. This mirror that teachers hold up in front of each child is powerful beyond measure. And, as with any kind of great power, comes great responsibility. You see, our school system reflects what society has decided is valued. School is where teachers are asked to look for those things we have decided are valuable to society – that gift or talent or genius or fast-track stuff that will advance us as a nation. Teachers are also told to look out for and measure these things so we can decide how much to invest in the little bodies holding said valuable items. Teachers develop their mirrors and hold them up to their students through the words and time and effort they put into each of their students. At the very beginning…no, even before the beginning of formal schooling, we begin this search for those valuable things in children. Teachers give tests and take anecdotal notes and refer children for various placements. We try to be really efficient with this because there are so many kids and so little time after all. The quicker we can identify who to invest in, the better it is for all of us. We can then get on with our investments and cut our losses. Right? Not right. See, there is a much longer list of valuable things that don’t make it to those mirrors and this is what I believe is at the core of our problems with the education system that is in place. You listen silently and take mental notes about each child. You are awed and increasingly more anxious about the responsibility you now have to lead them down the road intended for them. Their Purpose for being here. Each child has a Purpose. You know this to be true. You begin to form their mirrors. If you knew these things about each of your students. If you had the magic of knowing exactly how amazing each child could be, would be, would you then, in the busy moments of your teaching day take just one extra moment to guide the hand of the child with the messy handwriting? Or ask some good questions of the boy making a mess with the watercolors? Or say a kind word to the quiet boy who is by himself? Or offer a cheering pat on the back of the chatty girl before asking her to get to her morning work? Would you do just a tiny bit more just because you KNOW. 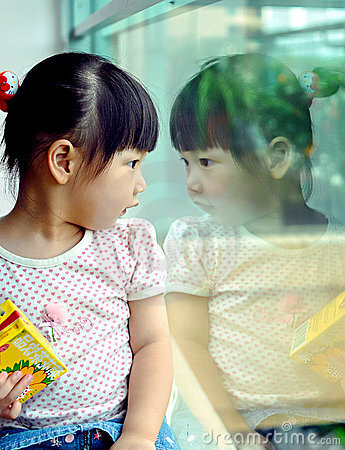 You KNOW exactly what to reflect in that mirror you hold up for each child. 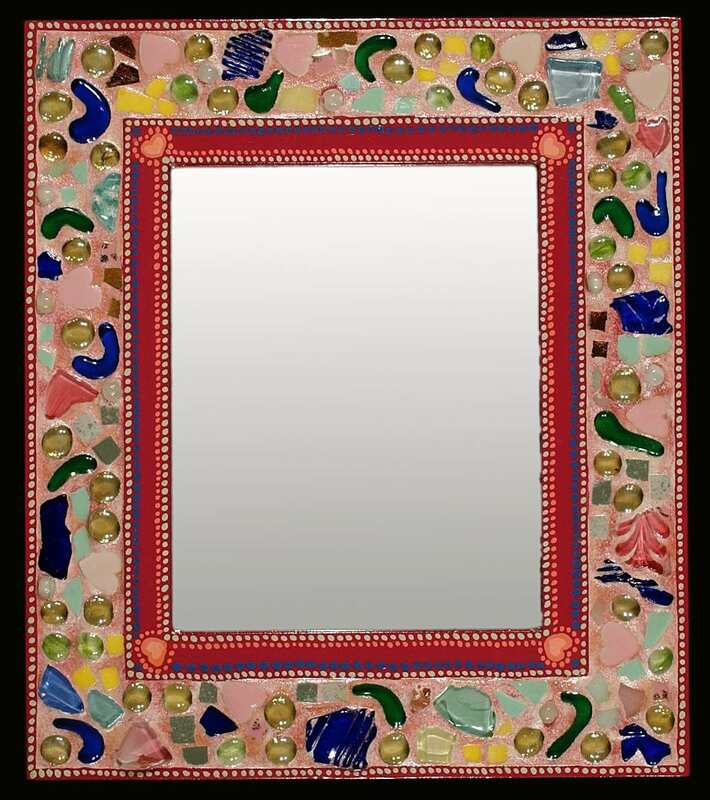 Would you shine up each mirror just a little more carefully because you wanted to be sure that you reflected just the right image of the amazing potential of each child with whom you have the honor of spending this school year? Unfortunately, there is nobody there with you standing at the door on the first day of each school year. There is no magic clipboard to peek at. There really is no way of knowing each child’s Purpose. And what you see as each child’s potential rests on you. On your knowledge about what you teach, your beliefs about people, your attitudes about the qualities people have, your biases, assumptions and expectations of the capabilities of people. You may create your mirrors based on what you know (or don’t know) about the family or race or language or social class or immigrant status or personality of the child. You have to explore what forms your lenses and perspectives and filters. How you create your mirrors and what you hold up for each child is important. You have some important work to do. They can change the world. They will change the world. You change the world. What do they see when you hold up their mirrors? My truth is that as a parent, I am vulnerable when I leave my child with you. I don’t know and I have little control over the mirrors you will create for my children. I do know this truth. I know that you will create those mirrors and you will hold them up everyday. And my children will look into their mirrors everyday and they will live up or down to what they see. My children are my most precious gifts I leave with you 180 days of the year. Please be thoughtful. Please be intentional. Please careful. Last Friday evening I tried out a drumming class with Brian (the man I married) and David (my 6 year-old). I was secretly certain I would have a hard time keeping the beat and feeling the rhythm and I was correct. Apparently I do know some truths about myself and, it seems, simply being born and hearing and loving beautiful African rhythms all your life does not affect your genes. I struggled to keep the beat I was supposed to keep while everyone else played their different beats so that all our beats could blend into beautiful, heart-pounding music. 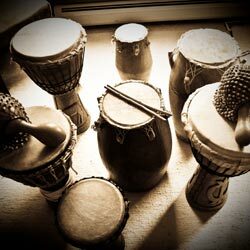 I kept getting lost in other players’ beats and joining in on theirs or I would lose my beat because my mind wondered off to enjoy the combined or whole drumming from the outside. This has always been hard for me. Seeing the trees for the forest. It’s hard for me to focus on a small piece of the puzzle when I can see the big picture. I struggle to remain focused on the details. When I took a music class in college, my professor often asked us to listen for the violin or the piano or the bass in the background and while everyone else nodded wisely as they listened and HEARD the separate instruments, I nodded wisely and was crazy confused in my head. I heard music. Beautiful, synchronized music. I could hear it all at one time and got lost in its beautiful WHOLE sound. But I could not tell you the beat or what instruments made up all the beautiful SOUND that I heard. Maybe you can relate. Please let there be someone out there that can relate. It can’t just be that I got no rhythm (yes, I can say that with the correct accent). This was not preparation for a performance or competition nor was I being recorded in any way to go down in history or even on a YouTube video. This was certainly NOT my magnum opus. This was just light and fun and a great chance to show my son, who I hoped against hope would have a better sense of keeping the beat and feeling the rhythm, how to try something new win or fail. Not having the rhythm genes myself, I had hoped he’d gotten some from his Daddy’s side of the family. So I tried my best and drummed on. And I had a great time. I smiled hard when I missed or inserted beats even as the instructor focused right in on me and modeled RIGHT NEXT TO ME and OVER and OVER again the beat I needed to follow. 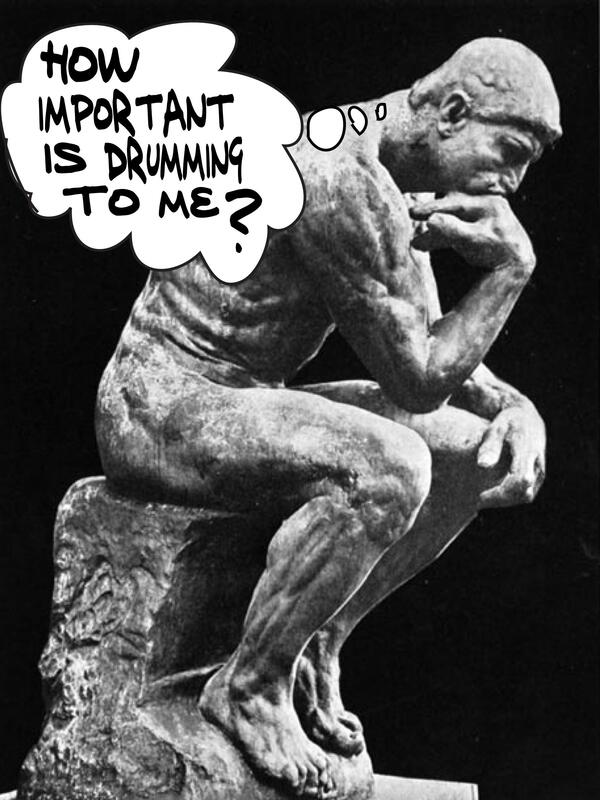 I could have sworn he looked a little puzzled at how hard I was struggling to get down the simplest beat. Still I had a great time. There were even moments when I let loose and closed my eyes, shaking my head to the beat of the music…and then immediately got lost with my beat. Oh well. I thought about this experience later and I have come to terms with three things. 1. I’ll never be in a band nor an orchestra nor a choir – and I have tried all three. 2. Learning is most fun when you allow yourself, going in, to make mistakes. When you can get that mistakes will be made and that the mistakes won’t make or break you then your learning can happen. It’s how we learn. As soon as we can accept that mistakes are part of the learning, then we are free to learn the most. 3. It felt GOOD to learn something new. In my walk of life, my work life, I’m an “expert” in my field and I am the one doing the teaching. Sure I learn from my students, too, and they keep me challenged. But being on the other side as the learner and making my mind and body do something I’m not accustomed to doing was rejuvenating. It was like a new part of my brain was at work so I was awake in a whole different part of my brain. Despite my being rhythmically-challenged, I’ll probably go back again and enjoy it just as much. A younger version of me would have gotten embarrassed and never gone back. My time on this beautiful earth has taught me that life is too short to avoid things you love to do for whatever fears you have of failing or of looking silly, or of being laughed at, etc. Most of the time, people are too into themselves to even notice me anyway. I know I’m not usually thinking about and judging what others are doing. If I’m paying close attention to you it’s either because I’m trying to pick up some tips OR I’m in deep admiration of your courage to do whatever you’re doing while not being perfect at it. I’m committing to trying something new as often as possible rhythm or no rhythm, rough or smooth, off-key or not. When I was seven years old I learned a lesson that has shaped what I do today. It was a very valuable lesson and I learned it in an instant. 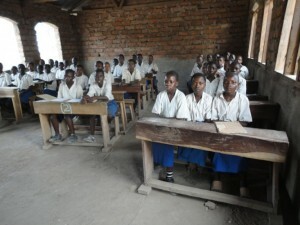 My first experience of primary (elementary) school was in a rural school in Mzumbe, Tanzania. At the time we lived there, Mzumbe was a small town with mostly Tanzanians and a few expatriates (AKA foreigners/aliens/wazungu/wahindi). My siblings and I were all born in Tanzania and had Tanzanian citizenship. However, true belonging was never an option no matter what. This was an accepted fact by native Tanzanians and expatriates alike and there were not hard feelings and even deep friendships. All the other expatriates in Mzumbe chose to send their kids to a private school, but not my parents. They seemed determined to have us get the full experience of our home town. My parents saw no reason to pay for us to go to a private school when the local school was free. So we attended a very rural school. Being THE ONLY kids who were not native Tanzanian, we were a curious sight to many of our school mates who were rarely, if ever, around anyone who was not like them. Our hair, for one, raised a lot of interest and often got touched or pulled or played with on a daily basis. I have several memories of the 2 years I attended Shule Ya Msingi Mzumbe (translates to Primary School Mzumbe). Can’t say that most of them are fond memories as I spent most of my time there a little afraid of the teachers, confused because I did not speak Kiswahili fluently, and extremely shy because that was just a part of my little Rhina self. I was extremely and painfully shy and school was not a happy place for me when I was little. 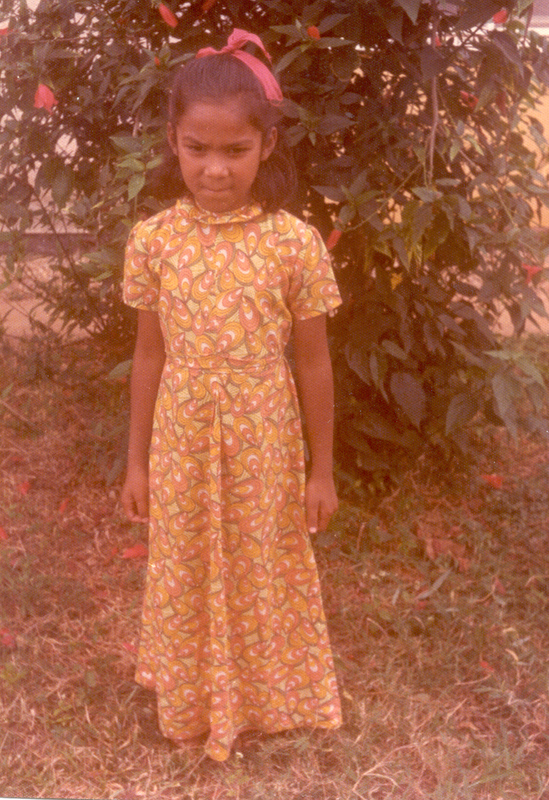 I would much rather have been home with my mother or hiding behind her sari in public. Little 7 year-old self feeling very stylish. Every morning, holding on tightly to one of my older siblings’ hands, I walked to the local primary school, hoe in hand on days it would be needed in the field. Yes, we planted maize and cotton, picked it, shucked the maize and ground it throughout the school year. Tanzania was a socialist country at the time and all local schools were preparing students to sustain themselves and their communities. At the end of each term, enough maize was boiled for the entire school and we got to stand in a long line and pick one cob when we got to the humongous pot sitting on the stones with a fire lit under it. We had no electricity nor running water at the school. Our one shared toilet was a tiny brick room sitting atop a deep, deep hole in the ground. I peed as little as possible while at school for fear of falling into the hole I could look into. At random times in the school year, a medical van would pull up and everyone was lined up for vaccinations whether they wanted them or not. I vaguely remember someone walking up and pulling me out of the line once and telling the nurse I didn’t need to get the vaccination because I’d probably had one already. First thing every morning, the entire school, from grade 1-7 gathered outside in straight lines, sang the national anthem, announcements were made by the headmaster and those who were tardy to school were called to the front, asked to lean over and obediently received their “back” lashes for being late to school. Unfortunately for Henry, my oldest brother, when I was called up a couple of times the headmaster looked at me and declared I was too little so could Henry come up to the front and take the lashes for me. He did. We still laugh about this but I’m never quite convinced he thinks it was that hilarious. Once, there was a big commotion at the school because a group of Masai came and camped out in the middle of the school yard, cows and all, because a group of kids who attended the school had insulted some of their kids on the way to school. One of the elders had insisted on speaking to the headmaster to get an apology. Of course, the kids responsible got their lashes and all went back to normal. Never a dull moment for a timid little girl like me. The quality of education was by no stretch of the imagination stellar in any way. Teachers talked at us from the front of the class pretty loudly, wrote our names on the board for lashes when we were caught off task, and instilled a deep fear of school and authority in us. I vividly remember getting to school late one morning, running into class crying after receiving my lashes and then having my teacher yell at me and hit my knuckles with the edge of a ruler because I wasn’t writing my word problems small enough to line up on the paper to create a neat little math equation on the end. I was six at the time. Everything was taught in Kiswahili and English was taught as a second language. Needless to say, when it was time for tests and the teacher was in the classroom writing out the test questions on the blackboard, classmates would lift me up to see the questions and ask me to tell them the answers. I often obliged because I was too afraid and too timid to speak up for myself, particularly since most of my classmates had started school much older than I had. This is how I remember the inside of my classroom looking like at Shule Ya Msingi Mzumbe. So it was at the end of a term after we had our grades for each subject posted outside our classrooms for everyone to see that I learned the lesson I never forgot. I was in our living room with my Daddy and we were talking about how I’d done alright at school. I then shared what I thought was a brainwave of a thought. I said to my dad, in an unusually confident tone, “Daddy, I don’t understand why the other students don’t do well at school. We have the same teachers, the same books, the same pencils and time in school. So why don’t they do as well as I do?” Laugh away. Or cringe if you will. It’s embarrassing to share this publicly, but…the truth of who I am, right? It was not typical of my father to lose it like that. I must have hit a nerve. His line of work was rural development so he knew some things and cared about why things were the way they were. He often spent weeks at a time in the field with his students. He had compassion and a deeper understanding of how people lived there. I was silent. My face was hot. I felt so silly and embarrassed to have thought such a thought. How could I have imagined that it was all the same and that my privileges were givens? Suddenly everything was very clear to me. You could say my Daddy slapped some sense into me that day and I have not forgotten it. It was the difference between equality and equity. Getting the “same” things in school did not mean that we were getting what we needed to succeed in school. Our mere presence in a classroom with a teacher was no guarantee for success. It wasn’t that I had it better or they had it worse. We had it different. And what made the difference in school success was simply that I had the things that “matched” what schooling was about and my parents, because they were first generation college graduates, knew what I needed to succeed in school and provided me those opportunities. What they had was exactly what they needed to succeed in life but it was not the things that matched what school was about. This truth remains the same to this day. I attempt to teach this truth to my college kids… er…students who are teachers or wanna-be teachers. In my work with teachers, I want them to get this first – that there are no deficits. There are no holes to fill. It’s not because kids are lacking in something that they don’t succeed in school. It’s not because their families are broken or because their parents don’t care about them or school. (And, incidentally, if their parents really didn’t care about them, isn’t it then crucial that YOU do). No, it’s not that they are deficit. All children are born whole. All children are born complete. All children are born curious and equipped to learn about their world. To learn how to survive and communicate and connect and play and seek joy and love. All children have this natural instinct. We are wired this way. All of us. When it comes to school success, what matters is the match between what we, as a society, have decided is what we value in school and your everyday life experiences. Basically, how much of the school-valued stuff do you get at home? Because many children’s ‘home selves’ don’t match school well, they struggle to succeed in school, while for others, it’s a smooth transition. There’s a plethora of professor knowledge I could delve into but I did not envision professor talk in telling my truths. I can humbly admit that could be boring for some and sometimes requires that you add some unnecessary but impressive layers of 4-syllable words and references, i.e. culturally responsive pedagogy, critical pedagogy, culturally relevant teaching, cultural synchronicity, etc., etc., etc. There – that was my plug. Done. I learned a valuable lesson at age 7 and have spent the time between then and now exploring it and mulling it over and practicing it and trying to find ways to teach my students that lesson. Slapping that sense into them seems inappropriate, so I tell them the story sometimes and tell them often that they must be the bridges. They must create those bridges for the families who are filled with so much valuable knowledge that happens not to match well with school knowledge. After all, it was not those families that chose what to value in school and how to teach it to their children. But in order for them to succeed in the dominant society, they must double up and learn both – their home knowledge as well as the school knowledge. This is a tribute to all the women with whom I have been honored to share moments or years of friendship throughout my life. I am a lover of all things women. I treasure my friendships with women and I notoriously seek out the company, counsel and comfort of women. When I am in the middle of an incredibly confusing or frustrating or infuriating discussion, argument, conversation or heart-to-heart with the man I love dearly, I am entirely confident any one of my women friends would get me without me even having to share a small fraction of all the words I used up trying to explain my experience and perspective to my beloved. In fact, after some of those said conversations, I have been known to pick up the phone and phone-a-friend (THANK GOD for this invention) and check my instincts. And I have never been disappointed. A few words in and I get that they get me and I can breathe again and feel like a regular person and not some impossibly illogical human being. I need my women friends. This life would not hold a fraction of the joy nor sanity I experience if it were not for the women I have known all along – whether they be my closest girlfriends or women I have never met but whose words and experiences I have heard of and connected with or women I have shopped next to or been with in a crowded room and shared a moment, a glance in which we connected. I wholeheartedly love all things woman. Side note: my husband, Brian, actually asked me if I had considered that maybe I might have wanted to marry a woman. You know how it goes…. If you love coffee so much, why don’t you marry it? … If you love women so much, why don’t you marry one? Juvenile. Although, when he asked, I did take a moment to consider if he might be on to something…but nah…I was born THIS way, not THAT way. Chica is a term of endearment I use for some of the special ones I’ve gotten to know more closely and, therefore, love just a little more dearly. Little word (pun intended) with a big message. It means something when I call a woman chica. Kaya, my 4 year-old daughter doesn’t quite get this yet. I called her chica recently to which she responded quite adamantly, “Don’t call me chica! I not your chica!” She doesn’t get it and we also don’t speak Spanish in our home. Chica, coming from me, is the acknowledgement of a deep connection I feel to you. It’s me telling you that you occupy a sacred place in my soul reserved for women only. A space that fills me up and one which overflows with joy at your being in my life. I believe in the power of chicas in my life and in the world. Let’s claim it, chicas, we’ve got it goin’ on! If you need a song to get you going here’s this one or this one or this one. And if none of those songs work for you, maybe this picture of a chica dancing to one of them will do the trick. 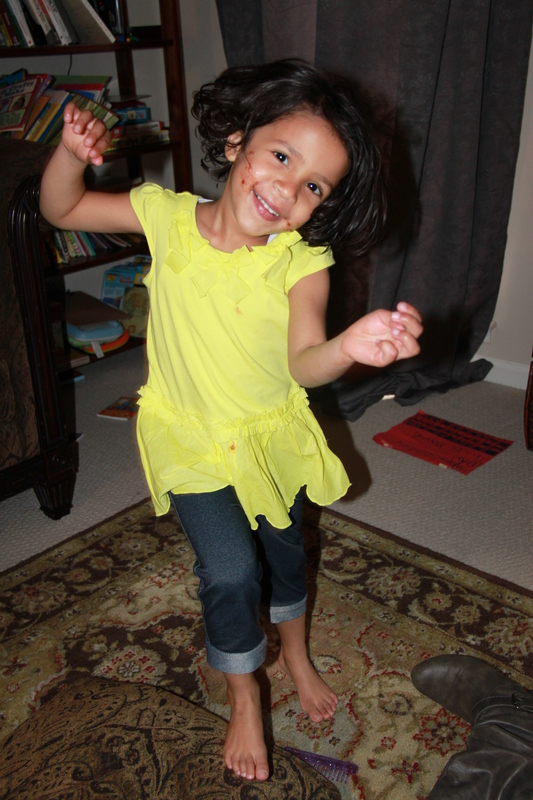 My little chocolate-smeared face chica, Kaya, dancing. We are women and we are here on a mission to raise up the world. I believe this and I get excited about the possibilities every time I witness that wisdom of women expressed around me in everyday life. We have our very own gifts that are only ours to give to each other and to the world. We show care and love in a way that only we can. We are able to see into each other’s spirits and souls with barely a second glance at each other. We can spot each other in a crowd and send out love vibes to each other quicker than instant messaging can do. We are able to get each other and life in ways that only we are gifted to do. We could be sitting in a restaurant next to another group of women and know exactly what the women in the other group are giving and getting from each other. We can see a mama trying to handle a crazy kid situation and we know exactly what that mama is dealing with on the inside. We can look at a little girl holding her little girlfriend’s hand and know exactly how happy she is on the inside for having that hand to hold. We can watch a teenage girl looking into the eyes of the object of her crush and we can feel exactly what she is feeling without a doubt in our minds. We get each other in sacred ways. Even gorilla women know this. Did you hear the story about, Binti Jua, an 8 year-old gorilla who rescued and protected a 3 year-old boy who had fallen into the gorilla den at the zoo and then carried him to a safe place and handed him over to the zoo people? You can check it out here. She was a gorilla chica, no doubt! She was aware that a woman out there would want her to take care of her baby the same way she would want someone to take care of her baby. I believe we human chicas share something with chicas in the rest of the animal world. The best piece of advice I’ve learned is to tell my kids that if they are lost, they need to find a mama with kids and ask her to help them. A mama with kids is a good bet because her woman instincts are likely to be heightened because of mamahood. The quote, by Bishop Desmond Tutu, hits home for me. I believe it and I strive to live it. We are sacred to each other’s spirits and to the world. We have to build each other up every chance we get. We need each other to hold up this world. Namaste, a Hindi word often used today in the Western world, particularly in yoga (something cool my peeps developed) sessions, translates to “The Spirit within me salutes the Spirit within you.” We need to say it to each other and tell it to our sisters and mothers and daughters. We need to recognize the divine spirit in ourselves and in each other. We women need to practice saluting each other this way daily in every interaction with or without words. I’ve been learning this lesson in my life. I believe it’s a lesson we must all learn and it becomes a rite of passage in our lives. I’ve got this message clearly imprinted on my soul and I invite you to hold me to it if I ever disappoint again. Thank you to the girlfriends who show up for birthdays and births and happy hours and potlucks and sick days and movie nights because they need to connect soul-to-soul and heart-to-heart and laugh at light things and speak about difficult things and support each other on important issues that change the world – or, at the very least, a very small part of the world inside us. You all rock my world and I will hold you up every chance I get. Cheers. Namaste. P.S. If you’re a man reading this, thank you for being curious enough and feeling enough of an affinity for some things women to read to the end. There’s another special, sacred place for you in my soul and I will tell you about it some day. Ladies first. P.S. ² This was the first post I asked Brian to preview and the only response I got was, “Did you seriously consider that?” He was straight- faced (pun intended) and concerned about my response. He did read it to the end, though. Raising Kids or Raising Test Scores?